Why leave your house when the easiest, cheapest way to get your driver’s license or learner’s permit is right here? 1-2-3 Driving School,Years and 10,000s of Adults Already Taught! 1-2-3 Driving School, a Garland, Texas State-Certified Driving School of years, presents Texas Adult Drivers Education.com. We are a Texas-based company that has successfully trained tens of thousands of adults for their driving test and no other online course can claim this. We do this every day, all day! Only Course Written By DPS Examiner! We know exactly what the Texas Department of Public Safety wants because our course is the only course created by an approved DPS driving test examiner and gives you all the secrets. We are the only Texas approved online course that is licensed to give the Texas DPS behind-the-wheel exam, unlike: Aceable, Texas Adult Driver, I Drive Safely, Adult Driver Ed Express, All Star Driver Ed, or National Highway Safety Administration (not a government organization). TexasAdultDriversEducation was created and is owned by 1-2-3 Driving School. 1-2-3 Driving School is licensed by the Texas Department of Public Safety to give the Driving test to all applicants for the class C driver’s license. Please visit TxDPS – Third Pary Skills Testing (TPST) schools for verification. Follow us to your driver’s license! Shortest Course In The State! Going through our course will feel like it takes no time at all but other courses with their reading and complicated instruction can take much longer to finish, wasting your valuable time in the process by having to repeat parts of the course just because you missed one question. Our course with it’s easy to understand video instruction and thoughtfully worded questions will have you out the door and driving before you know it! Our Innovative Course Is For Everyone! This is the course the State requires everyone to take. Even if you’re new to Texas, born in another country, or over 25 and have never had a driver’s license, we are approved by the Texas Department of Licensing and Regulation (TDLR) to teach you too! We can help you get out onto the road, by teaching what you need to know to get on the road and giving you the confidence you need. Our course includes video lessons, custom-created animations, engaging audio, and easy-to-understand questions. Our course includes video of a real, Texas-licensed driving instructor explaining situations and hazards that you may experience while driving, and most importantly, how to avoid them. Gaining this valuable insight and knowledge before ever having gotten on the road is a great boost to your enjoyable driving experience. With our proven, easy-to-understand course and competitive prices, you can’t help but be a driver! Take the course on your smartphone or tablet! We support iOS 4.x or greater on the iPhone, iPad and iPod Touch (using WiFi). We also support Android 2.3 or greater and recommend the use of a tablet with Android for the best experience. For more information about taking the course with your mobile device, please see our FAQ. Get Help Signing Up Now! A friendly customer service agent is ready to help guide you through the process of signing up for Texas Adult Drivers Education.com. Just give us a call at (972) 633-1605. 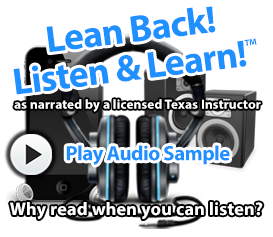 Take The Written Exam Online for your Texas Driver’s License! Watch the videos, study the material, then take the exam. It's that easy! Take your online written exam for your driver's license and pass with at least 70%. Download and print your Texas Adult Drivers Education Course Completion Certificate as soon as you finish the course! 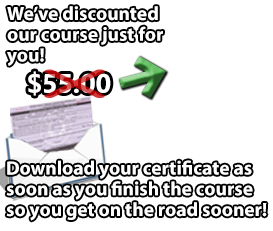 Take the 1-hour DPS Impact Texas Drivers course and print out your certificate of completion. Do it - now it's done - Congratulations!